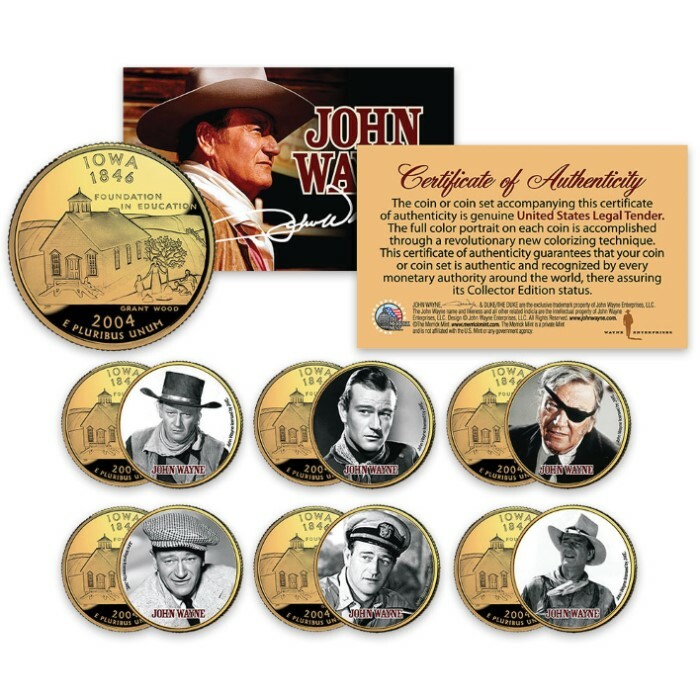 John Wayne Colorized 24K Gold Plated - Set Of Six | BUDK.com - Knives & Swords At The Lowest Prices! Iowa born, John Wayne is an enduring American icon, who was among the top box office draws for three decades as an Academy Award winning American film actor, director and producer. Own or gift this incredible, officially licensed John Wayne 24K Gold-Plated Coin Set. 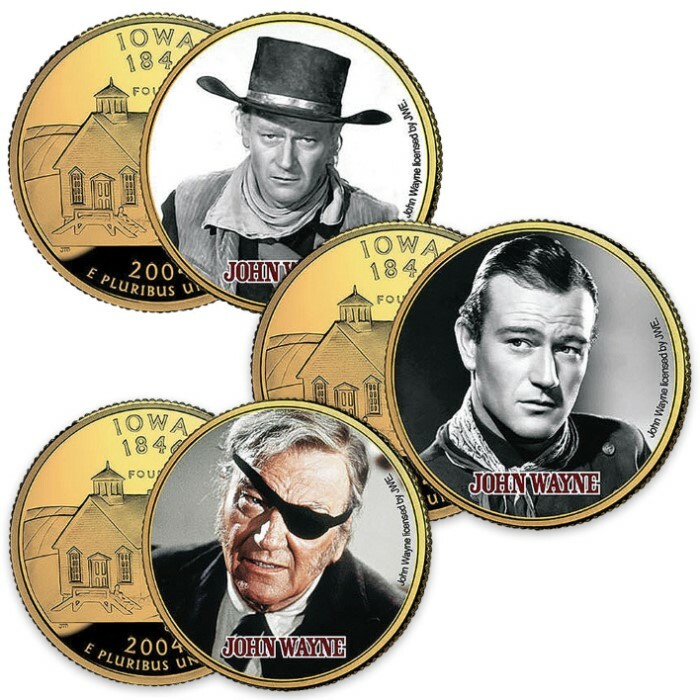 The limited edition, six-coin set pays tribute to his movies including “Red River,” “Stagecoach,” “True Grit,” “The Quiet Man,” “They Were Expendable,” and “Hondo.” Each genuine Iowa Statehood Quarter has been colorized using a unique painstaking multicolor authentic process and has been layered in genuine 24-karat gold. The colorizing process involves the unique application of special inks directly to the surface of a coin so that you get an everlasting colorized coin collectible of ultra-high quality. 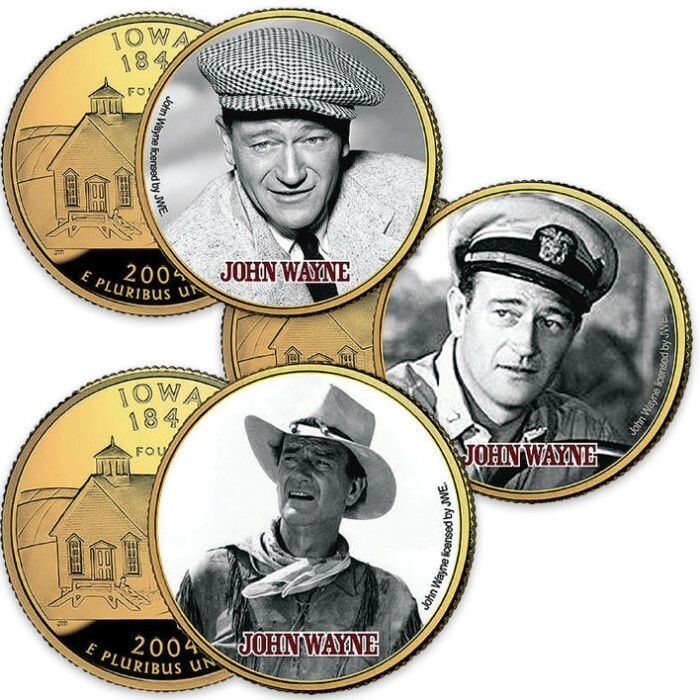 Each coin features an Iowa State emblematic design on the reverse and a colorized image of John Wayne on the obverse. The coins are encased in a premium coin capsule and have a certificate of authenticity to guarantee that they are recognized by every monetary authority around the world, assuring their Collector Edition status.